Bicycle cleaning sounds like a no-brainer but there are some very important things to keep in mind to keep it looking good and, more importantly, make sure you are riding safely. Most cyclists like to keep their bikes looking good but keeping it clean goes way beyond just looking shiny and helps to keep running smooth and trouble free as well. How often you need to clean it depends on on how frequently you ride and what kind of riding you do. For instance, if you ride every day you should clean it once per month. But, you are riding on dirt trails you need to clean it much more often to prevent undue wear on all of the moving parts. If you only ride once or twice per week on dry roads you can get away with cleaning it every two or three months. Use a environmentally safe cleaner or just warm soapy water. Use brushes to clean out hard to reach places where dirt accumulates. This is where you will get wear that can cause mechanical problems. 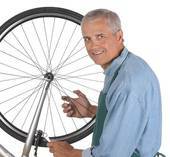 Remove the wheels from the bike and clean rims and spokes thoroughly. A good way to do this is to rest them on top of a bucket of soapy water. It is important that you spray degreaser on the chain ,derailleurs, crankset, and cassette cogs from the top down and not directly on the hub where it can get into the bearing areas and wash away needed lubricant. Let the degreaser soak for a few minutes and wipe it dry with a clean, soft rag to prevent scratching. This is where a bicycle repair stand comes in very handy. You can put the wheels back on the bike and just turn the pedal while letting the cleaning tool do its job. Use different rags for cleaning greasy parts than you use on the frame. There will be some grit in the grease that could scratch smooth surfaces. After you clean make sure to lubricate critical points like the chain and sprockets as well as any hinge points like derailleurs, brake pivots etc. A good lubricant is called Tri-Flow which has teflon particles in it. It has excellent penetration and lubrication characteristics. Note: I have no relationship with Tri-Flow. I just love their products. I have been using them for 25 years and found them to be one product that over-delivers on their promised performance.